Lassoing a runaway steer takes muscle control and nervous system precision, but not a great deal of force over a long period of time. Compare that to a baseball pitcher that is firing that ball into a precise area at high speed, repeatedly, for several hours. Of the many engineered traits we have, humans are also designed to throw. Then there's the batter who has to hit the pellet. Well, it looks like one at that speed, it may take a half a second for the ball to be released until it hits the catcher's mitt or the batter gives it a smack. Don't be telling me that you could do better, either. A study was done on the mechanics of pitching. If it was just up to muscle doing the work, there would not be anywhere near as much velocity. That whole wind-up and pitching motion involves the shifting of balance, extension of the arms and wrists, hip rotation, and much more. The study also paid homage to Darwin, spoiling a good bit of research with guess, speculations, and other unscientific nonsense. They wondered where this kind of throwing evolved, why, and when. Chimpanzees cannot do it, and they've had enough time to evolve that, haven't they? No, they have not. The Master Engineer designed humans to be able to do such precise, sustained throwing, and designed chimpanzees to do their tree thing. It's not that difficult to see that evolution had nothing to do with either humans or chimps, you savvy? What body structures uniquely equip humans to throw objects frequently, at high speeds, and—for the practiced—with great accuracy? 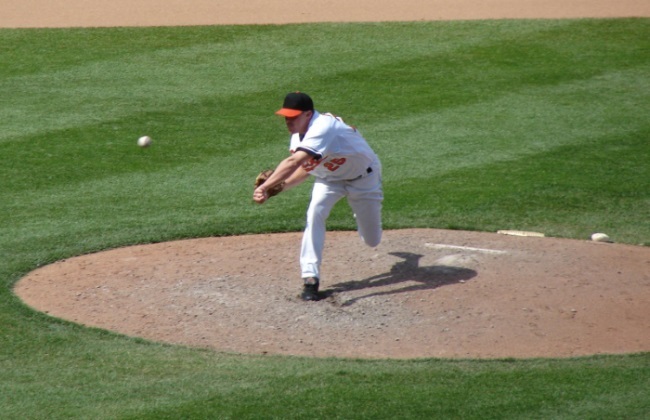 Research has revealed that if the throwing motion depended directly on muscle, we could only generate half the force that the human frame can actually muster. In the course of answering the question of where the rest of the throwing force originates, one recent study stumbled on a number of reasons why the human body looks like the product of specialized and intentional creation. To take a swing at reading the rest, click on "Why High-Speed Throwing Is Uniquely Human".